Open source freeware - no nags, no ads, and no bundled junk. Take control of your PDF documents - merge or split pages; stamp pages or add background watermarks; add page numbers; and even rotate pages. License: GNU General Public License ver 3. 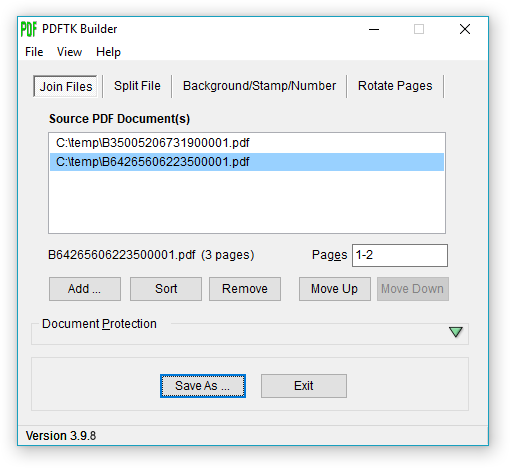 PDFTK Builder is a free graphical interface to PDFTK. Join - 'Join' allows you to combine pages from multiple PDF documents and/or rearrange pages in a single document (reorder, delete, & duplicate). Multiple documents will be joined in the order they are listed in the 'Source Documents' window. If you wished to insert pages from one document into the middle of another, the main document would have to be listed twice, once before (listing pages to appear before) and once after (listing pages to appear after) the document containing the pages to be inserted. If page ranges are not specified, PDFTK Builder will assume all pages for that document are to be included. Page ranges for each document in the list can be indicated by using a single page number, or a hyphen between start and end pages (reversed page orders are allowed). Multiple ranges are indicated by using commas or semi-colons between ranges. For example: Given the range "2-6,9,10" in a 12 page document, then pages 1,7,8,11 and 12 will be omitted from the output file. Split - separates each page of a PDF file into separate (numbered) PDF documents. For example: If the source document is MyPdfFile.pdf, then Split will create MyPdfFile_001.pdf, MyPdfFile_002.pdf, ... MyPdfFile_nnn.pdf etc for each page in the document. Rotate - 'Rotate' enables you to rotate a range of pages in a document. The rotation angle options are: right or left 90º; or 180º. Password Protection: The new document can be password protected (encrypted) by providing 'owner' and 'user' passwords. The 'owner' password does not stop users from reading the document, but it does restrict the actions that users can perform on that document - printing, copying, decrypting etc. Specifying a 'user' password will stop anyone without either 'user' or 'owner' passwords from opening and reading the document. The Password Protection panel can be toggled open and closed either by double-clicking it (or by typing either Alt+P or Ctrl+P). 3.10.0 3 April 2018 Bugfix: Minor collating page range bug. 3.9.9 3 April 2018 Bugfix: Fixed a bug when joining files that would overwrite one of the PDF documents. 3.9.8 31 March 2018 Bugfix: Fixed a minor form positioning bug when using multiple monitors. 3.9.7 30 March 2018 Bugfix: Fixed drag-and-drop broken in a previous release. 3.9.6 24 March 2018 Bugfix: Minor bugfixes and cosmetic changes. 3.9.4 26 April 2015 Added: support for Unicode filenames. 3.8 21 April 2015 Update: Added page numbering option. Cosmetic improvements to accommodate large fonts etc. 3.6 9 July 09 Update: PDF page count algorithm updated to read later versions of the PDF file format. 3.2 27 Apr 07 Bugfix: "Stamp" and "Background" was broken when applied to the whole document. 3.0 14 Apr 07 Collate no longer limited to 26 files. 2.3.4 20 Mar 06 Added 'Split' option and minor bug fixes. 2.3.3 17 Apr 05 Fixed broken link to help file. 2.3.2 4 Feb 05 Bug in owner's permission options fixed.